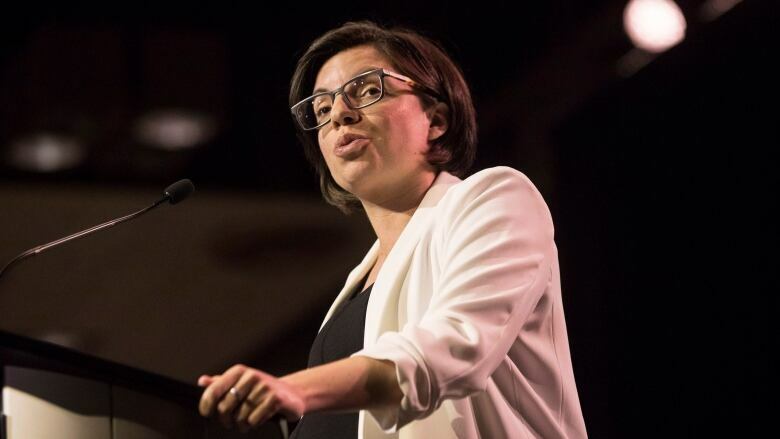 Niki Ashton has lost her bid to be the NDP's next leader. When the ballots were counted Sunday, the Churchill-Keewatinook Aski MP finished third in the NDP's leadership race, taking 11,374 of the nearly 66,000 ballots cast. Ontario politician Jagmeet Singh took about 53.6 per cent of all ballots cast to win the leadership on the first ballot. Shortly after accepting congratulations on the stage, Singh took to Twitter to thank Ashton and his other competitors for helping to "renew excitement" in the party, singling her out for her "courage to be unapologetically progressive" with her views on tuition, climate change, and gender justice. Ashton, an MP since 2006, did not immediately respond to an interview request from CBC Manitoba following the announcement in Toronto. But in a tweet Ashton thanked one of her supporters for her dedication, then added, "our movement continues." At her campaign launch Ashton had described herself as a proud democratic socialist and eco-feminist who vowed to "challenge the power of Canada's elites." This was Ashton's second try to win the leadership. She finished seventh in the 2012 race to anoint a new leader, a contest won by Tom Mulcair. Ontario MP Charlie Angus finished second in Sunday's race, while Quebec MP Guy Caron placed fourth. Congratulations to all 4 <a href="https://twitter.com/hashtag/ndpldr?src=hash&amp;ref_src=twsrc%5Etfw">#ndpldr</a> candidates. <a href="https://twitter.com/GuyCaronNPD?ref_src=twsrc%5Etfw">@GuyCaronNPD</a>, <a href="https://twitter.com/nikiashton?ref_src=twsrc%5Etfw">@nikiashton</a>, <a href="https://twitter.com/CharlieAngusNDP?ref_src=twsrc%5Etfw">@CharlieAngusNDP</a> &amp; <a href="https://twitter.com/theJagmeetSingh?ref_src=twsrc%5Etfw">@theJagmeetSingh</a> can be proud of their campaigns.